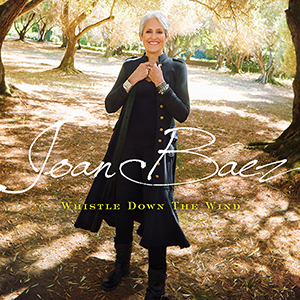 Joan Baez new album, Whistle Down The Wind, was release last Friday and has been receiving some exceptional reviews in the press and online, you can read some of the best of these and click through to read the full reviews below. Produced by three-time Grammy® Award winner Joe Henry and recorded over ten days of sessions in Los Angeles, Whistle Down The Wind gathers material by some of Baez’s favourite composers. If you missed it on Friday, you can listen to Baez’s interview on BBC Radio 4’s Woman’s Hour via the BBC iPlayer where Baez looks back on a life of music and activism and performs The President Sang Amazing Grace from the new album.